Parse Lua code and draw its call graph. # it excludes calls such as standard library or built-in functions. # these are calls made from the top level of your Lua program. print " node [shape=box color=\"#FFFFFF\" fontname=\"courier\" fontsize=12];"
print " edge [color=\"#CCCCCC\" arrowsize=0.8];"
# Detect and ignore comments. # Detect when we are at the top-level of the program; out of any functions. # This detection is not foolproof; it assumes the code is consistently indented. # Detect and track function definitions. # This includes only functions declared at the start of a line. next # Don't consider this line as a function call. # Uncomment the following line to help debug this script. This is a script to draw a call graph for your Lua code. It runs in awk and generates output, on stdout, designed as input to Graphviz via the dot command. 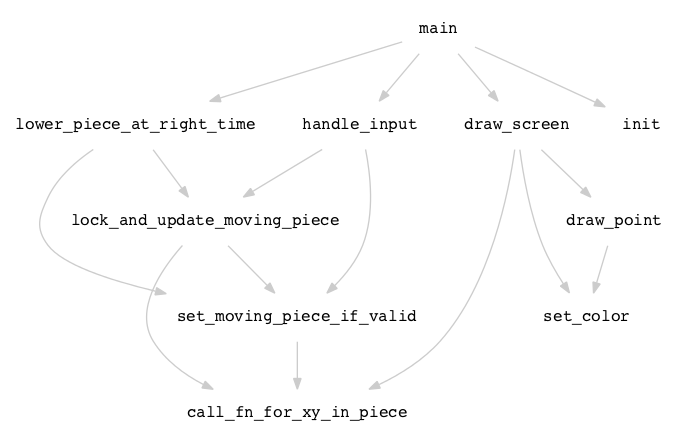 # This is a script that generates a visual call graph for a Lua file. # are calls made from the top level of your Lua program. print "  node [shape=box color=\"#FFFFFF\" fontname=\"courier\" fontsize=12];"
print "  edge [color=\"#CCCCCC\" arrowsize=0.8];"
next  # Don't consider this line as a function call. print "  \"" fns "\" -> \"" fns "\""